This afternoon, Phil came over to my desk to say he'd asked the executive chef for some samples of the new salad packaging Dining was going to be using, but instead, Steve sent over fifteen packaged salads! Maybe he misunderstood, or maybe he figured we were hungry. Either way, Phil figured we might as well get some photos and then, you know, eat the salads. Wouldn't you know it, this must've been the first day in three weeks I didn't bring my camera to work with me. Phil grabbed the old digital camera the office owns and handed it to me, but I'd already snapped a couple of iPhone photos. The office camera's battery was almost dead -- and the iPhone was getting much crisper pictures anyway. 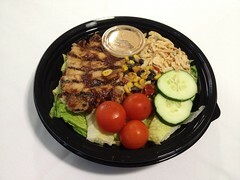 Then I set aside a firecracker chicken salad and a BBQ chicken salad to bring home. Ottilie and I enjoyed them as my living room slowly cooled off with the window air conditioner.